Here’s some nostalgia for our long-time members and a bit of history for the rest. This was Steve Flach’s fourth “dual sport” article that was published in the CCC’s Great Lakes Trail Rider magazine back in 2001. It’s interesting to watch the “tone” change from year to year in the subsequent articles as things progress. Those of us with direct involvement can also look back on the history of our organization/sport and see things coming together (in hindsight, of course). My fellow dual sport riders. The 2000 riding season has been over for a while and it is my sad duty to inform you that this past season was the first since dual sport was first offered at the weekend trail events that we suffered a downturn in participation coupled with other event problems that came up. In my dual sport iii article last winter, i made predictions that dual sport participation would continue to expand in 2000, 75-125 riders would attend most TTs, and 40% of the total signups at the trail tours would be dual sport riders. This did not happen. Total dual sport ridership at all weekend events in 1999 was 506 riders. This decreased to 397 in 2000, a 21.6% Drop!! Dual sport did not set a single record this past season. And we had to suffer thru having half of one dual sport course cancelled and another dropped altogether, due to permit and other problems with the state D.N.R. Only one event, capitol chapter’s rites of spring ride at whiskey creek, saw an increase in dual sport riders. And this was only from 97 in 1999 to 99 in 2000. Three events, tomahawk’s phillip bean event at vanderbilt, tri-county’s brevort ride, and bulldog’s atlanta t.T., Had the same dual sport participation from a year ago. The orv safety patrol’s event at south branch saw a three rider decrease, then came big decreases for the capitol-tri-county vintage ride, 62 in 1999 to 37 for 2000, pathfinders-west michigan carrieville t.T., 38 In 1999 to 0 in 2000, and bentwheels’ color tour, which attracted 71 dual sport riders, compared to tri-county’s 1999 color tour, which drew a record 118 dual sporters. You may all be asking, ‘what happened???’. Believe the main culpert was the price of gas this past year, which attained record highs, eventually reaching as much as $2.20 A gallon in some areas. A second reason may have been the state d.N.R., Which gave some chapters problems with obtaining the necessary permits and caused the partial or full cancellation of two dual sport courses. The d.N.R. wants a finished dual sport course to approve as much as six months in advance, which is impossible for me to make up for a TT, due to the winter weather. My chief helper, jim karl, suggested i could get around this by submitting last year’s dual sport courses for the spring and early summer events in 2001 while working on courses for 2002 this coming season. So next year will see us dual sporters riding some of the same routes you rode in 2000. The 2001 rites of spring dual sport course will be all new as i was able to complete it this past fall after the color tour. But the next two events, orv safety patrol and tomahawk rides, will be the same dual sport courses as in 2000. I will reverse the direction of these courses so it will seem like a new ride. The trail tours in august, september, and october will not be a problem. I kept records of the total rider signups at the weekend t.T.’S this past season that offered dual sport. This total for the 8 events was more than 100 signups less than for the 8 events in 1999. The 2000 season started out with a bang with almost 700 riders at the rites of spring. Dual sport participation contributed about 15% of this total. The next event, the orv safety patrol’s t.T., Saw a large decrease in signups, going from 191 in 1999 to 156 for 2000, with dual sport accounting for 26% of this total. Capitol-tri-county’s vintage ride decreased for the first time with 181 signups in 2000 compared with 214 in 1999. Dual sport had about 20% of this total. Next up, tri-county’s brevort ride continued its success story for a fourth straight year with another increase in signups, going from 165 to 175 riders. Dual sport participation continued to be a major bright spot at this event with more than 29% of the total signups. Bulldog chapter’s early september event in atlanta saw a small decrease in signups, although dual sport totals remained about the same. Pathfinders-west michigan’s late september t.T. had a big increase from 1999, going from 134 to 171 signups in 2000. Better weather this year was the main factor in this increase. Dual sport was zilch at this event because permit problems forced its cancellation. Bentwheels’ black lake color tour produced about 100 less total signups than tr-county’s 1999 color tour at vanderbilt, but this was expected due to the further distance everyone had to travel. Dual sport accounted for more than 21% of riders at this event. Well, dual sporters, these are the facts from this past season. What about the future for dual sport? Will this decrease in ridership be just a one time thing or will dual sport continue to go downhill? Only your continued participation can keep it going. This past season has made me think about not construction dual sport courses for the c.C.C. In the future if the comming season produces another large decrease in dual sport totals. As has been suggested by some of you dual sporters, may go to making up dual sport routes for just myself and a few friends to enjoy. I would like to thank the following people for thier time and effort in helping me with dual sport in 2000. At the top of the list again was jim karl. Jim was my most available weekend helper and sweep rider. Again equal thanks go to his wife, susan, for allowing him this time. Much thanks again to tom wall for useing his home computer system to make up the fine dual sport maps you riders were given for the events. However, i lose this service for the future as tom does not want to continue this due to the time it takes. He did inform me he would help me more with work rides in 2001, so i lose a map maker but gain a helper. It would be nice for someone to step foward and take over this service or some of us will have to go back to hand drawing the maps. And this is very time consumming. Thanks to gary purdy in roscommon for the ‘roughing in’ work he did for the vintage ride in 2000. 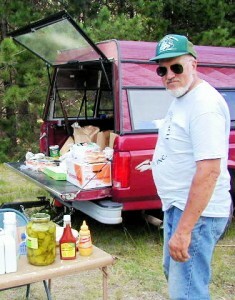 Gary said he would do this again for the 2001 vintage ride and help me with the orv safety patrol event at south branch. These two events are right in his backyard, so this saves me time and money not having to travel to these areas as much. Dave brock was again dual sport’s pre-rider. Dave was usually the first signup saturday and first dual sport rider on the course. He made sure to replace any missing marking ribbons. Others who contributed to dual sport in 2000 as helpers were shannon ruthrauff, bern bidinger, don gentz, dan gentz, tim gentz, brianmiller, pete jantschak, john wardell, lee rodgers, steve carmer, tom myers, and jim mcvicar. If i forgot to mention any other c.C.C. Members who helped with dual sport in 2000, your assistance was appreciated. As always, can always use more volunteers to help me out. If interested, call me at 616-731-4779 anytime. There will some changes for the comming 2001 dual sport events. I am going to scale back what i have been putting out for routes for you dual sporters. Next year, i will offer either one 100+ mile two loop course and a shorter 50 mile third loop or three separate 50 mile loops at the events. Pete jantschak has agreed to contribute an 80-90 mile easy igirle-mani course made up of mostly county dirt and gravel roads. This will be for those riders that want an extremly easy ride or have cycle with tires not suited to a lot of two track riding. Am hopeing this may contribute to 25 more dual sport riders showing up at the t.T./ S . So any of you c.C.C. Members that have wanted to try dual sport but don/t like a lot of sandy two track, you have a different option for dual sport at the events. Sweep riding will continue on sunday only (i can always use volunteers for this, and there will be few or no marking ribbons on the routes. I will again offer route sheet holders for sale at signup, two sets of millage will again be offered on the route sheets, and the larger type will continue. After reviewing the events schedule for 2001, i see it will be a little slimmer than in 2000. There will be just 7 weekend trail tours with dual sport offered instead of 8 as in the past. I will be handleing 6 of these for dual sport. Again i appeal to those of you that are getting older, tired of the same old iwhooped out 1 single track trail, want a different riding option at the events, and you c.C.C. Members who do not come to the t.T. S. Dual sport just may be the thing you are looking for. This part of the article is always the most important. For anyone who wants to try this type of riding at the trail events, make sure both you and your cycle are road legal. For your bike, this means you must have a horn, at least one mirror, working head, tail, and brake lights, united states forestry approved muffler/spark arristor with a 94db or lower sound rateing, d.O.T. Approved tires, license plate, and an orv sticker (for the posted trail sections,. You must have a cycle endorsement on your drivers license, cycle registration, and cycle insurance. If you have an un-licensed cycle, quad or three wheeler, and normally ride just the posted single track trail or orv trails, then do not go out with a dual sporter and try to sneak thru. If caught, this can result in dual sport and the c.C.C. Getting in more trouble with law enforcement authorities and we do not need this. I hope dual sport makes a recovery from the down year we just finished. Know there must be many road legal riders in our organization who have never tried dual sport at the t.T.’S. Please come out next year and help us out with your participation. With two different types of dual sport riding now offered, there should be something for everyone to enjoy. Hope that my prediction of 75-125 dual sport riders at most t.T.’S made in the dual sport iii article for the 2000 season comes true in 2001. Participation at the first two or three events next year will give me an idea as to what to expect. The final part of my article is an appeal to someone or a couple younger than myself (i am 54, in the c.C.C. Who would be interested in gradually takeing over the dual sport work i have been engaged in for the past 9 years. If interested, you should be a good off-road rider, have a reliable road legal off-road cycle, have a good sense of direction, have most or all weekends free and like to spend them in northern michigan riding, and preferably have an ico electronic odometer on your cycle. You should be someone who would enjoy, as i have had, doing the necessary riding and paperwork to make up a dual sport course. The last two or three years, find i have less energy each year to continue this work at the pace i keep. If someone does come foward who wants to take over this work in the future, i will be happy to advise you on what you need to know and would continue to work with you if you need help or advice. Finally, come out in 2001 and swell our dual sport ranks to make the comming season a sucess.